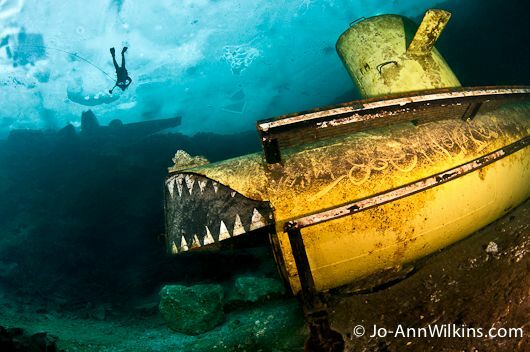 Underwater photographer Jo-Ann Wilkins takes you on an adventure under the ice in her native Canada and shares her techniques and tips. 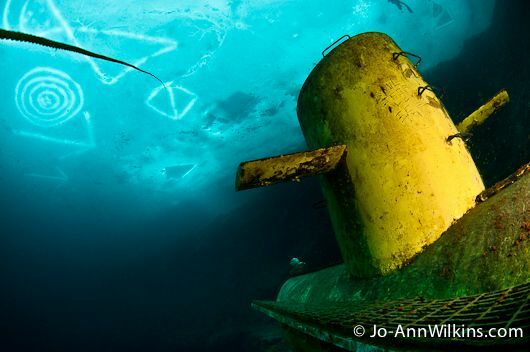 Diving under the ice offers truly unique photographic opportunities. 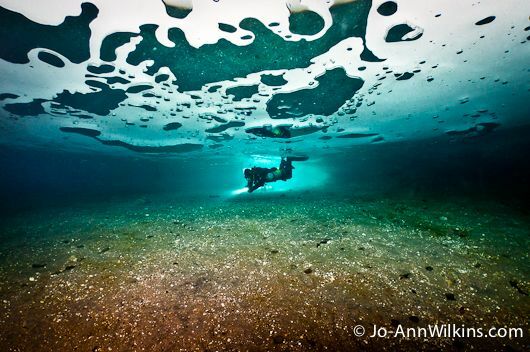 Even common dive sites or dive sites with little to no interest become fascinating once covered by ice. Bubbles exhaled by divers create unique and constantly changing patterns. The ice itself offers unique formations, textures, or cracks that are interesting to photograph. However, one of the most fascinating features of ice diving are the beautiful beams of light that penetrate through the hole by which divers enter to dive under the ice. On a sunny day, those beams of light are simply spectacular. All of the following pictures were taken at Morrisson Quarry in Wakefield, Quebec, Canada. Notice the hole in the ice on the top left-side of the image and the beam of light penetrating through the water. Nikon D300,Tokina 10-17mm, F9, 1/60sec. Silhouette of a diver in shallow water under the ice. Nikon D300, Tokina 10-17mm, F8, 1/100sec. 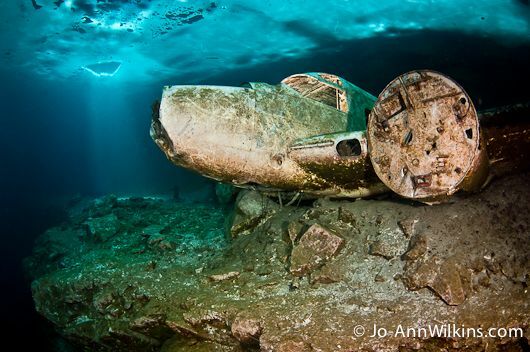 Doing photography under the ice can be challenging at times. 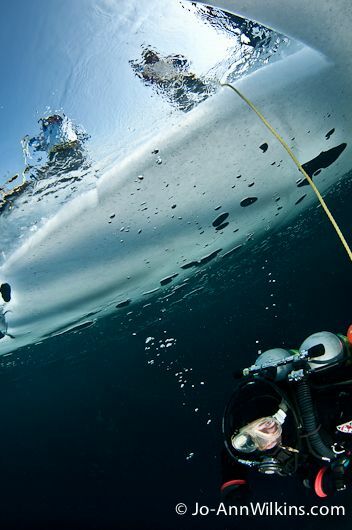 There are basically two ways of diving under the ice: traditional ice diving techniques, which involve being tied with a rope to your buddy and to a ‘tender’ at the surface, or by using cave diving techniques and equipment (redundant gear and reel line). When diving using traditional methods, the diver is generally tied to another diver and both are tied to the surface with a rope or safety line. A ‘tender’ usually holds the line and gives tugs every couple of minutes to which the divers have to respond to with another tug to say that they are ok. Obviously, holding a rope, being connected to your dive buddy in relatively close proximity and having someone give tugs on the rope every couple of minutes is distracting and somewhat difficult to manage when doing underwater photography. It is easier if both buddies are on different lines and to warn your ‘tender’ not to tug on the line too often nor too hard. Secondly, you need to be extremely careful not to tangle your camera and strobe arms in the safety line. The safety line floats, unlike reel lines, and you are likely to get tangled up if not careful. And lastly, as an underwater photographer, you can get distracted very easily by an interesting subject and lack to monitor the tension on the safety line, causing a slack in the rope. The excess line will float up under the ice and any communication effort between you and your ‘tender’ will become obsolete. A concentrated photographer doesn’t notice the slack and when he does notice, it becomes a pain to try to rectify the situation. Hole in the ice with safety lines of three divers. Nikon D300, Tokina 10-17mm, F10, 1/200sec. 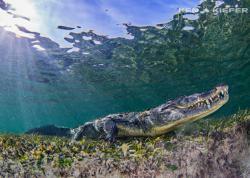 Any underwater photography equipment you use will need to be assembled in a dry, non-humid, and temperate environment. Make sure that you use fully charged batteries for your camera and strobes as the frigid water will drain them more rapidly than in warmer waters. The way batteries are built and how they generate electrical energy means that at low temperatures, they all lose power. If you plan to use the internal flash of the camera in the housing, it is best to carefully place silica packs inside the housing. The heat generated by the internal flash inside the housing and the icy conditions outside of the housing are likely to generate condensation, especially in polycarbonate housings. The silica packs will absorb some of the moisture and will prevent condensation that would fog up your lens and damage the fragile electronic components of your camera. Avoid leaving your camera exposed to the sun before or in between dives as it could also create condensation once you get in the cold water. After a dive, make sure to remove your camera from the housing as soon as possible and to let it warm up slowly to avoid condensation. For instance, you could place it on a windowsill or an unheated porch for a couple of hours so it can rise slowly to room temperature. 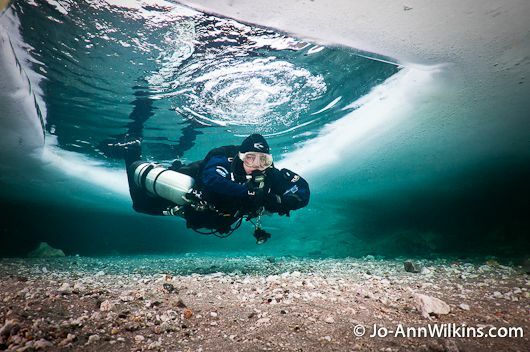 A diver posing under the hole in the ice. Nikon D300, Tokina 10-17mm, F10, 1/200sec. Always shoot looking up to maximize the amount of available ambient light. Try to choose a sunny day. You will get a beautiful beam of light that will penetrate through the hole in the ice and you will get more ambient light throughout. Avoid overcast days when possible and try to choose a day where there is not too much snow on the ice, which will reduce luminosity. Pay attention to the exhaled bubbles that accumulate under the ice just above you and your buddy. They can make very interesting patterns and formations and can act as a mirror if you find the right shooting angle. Look for unusual formations in the ice such as interesting cracks or objects that have frozen in the ice (for example, leaves or branches, old soda bottles, frozen fish). 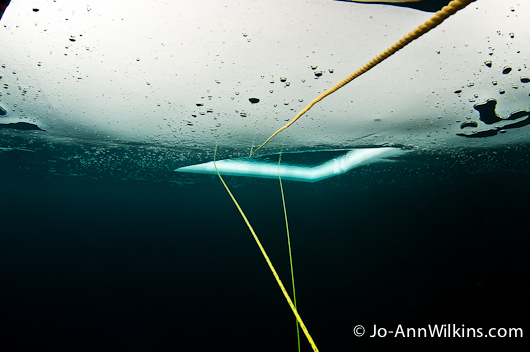 Find a creative way to shoot the hole in the ice from which you are diving. Ask your dive buddy to pose for you near the hole in the ice. Make sure you communicate how you want him to model before you start the dive. Photograph divers standing upside down under the ice. Have people use a shovel to ‘draw’ large designs or patterns in the snow. Once under the ice and at a certain depth (maybe 50-60 feet), you will clearly see these patterns in the snow and they can make humorous ice diving pictures. Try split shots where you see partly under the ice and over the ice. Turn off your strobes and try silhouette shots. Non-divers had fun shoveling designs and patterns in the snow above the ice. At the top left, you see the safety line that connects me to the surface. Nikon D300, Tokina 10-17mm, F7,1, 1/80sec. By nature, ice diving is best suited for wide-angle photography. However, on a recent dive, I noticed an interesting tiny ‘bug’ that lives under the ice and that was ‘walking’ on the air pockets under the ice. 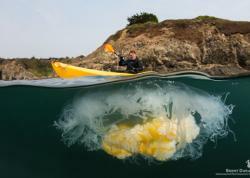 I even saw one of these bugs swimming while holding on to an air bubble. Unfortunately, I was set up for wide-angle photography and could not do any macro shots but will definitely be back soon to shoot these interesting creatures under the ice. In other words, get close to the ice; you might see small creatures living right under it that would make great macro subjects. D300, Tokina 10-17mm, F13, 1/250sec. We had spectacular visibility under the ice on that dive (over 100 feet) in a quarry, which is one of the advantages of ice diving. Nikon D300, Tokina 10-17mm, F7,1, 1/80sec. From this angle, we can see the tenders at the surface and the safety line that connects me to them. Nikon D300, Tokina 10-17mm, F7,1, /1250sec. 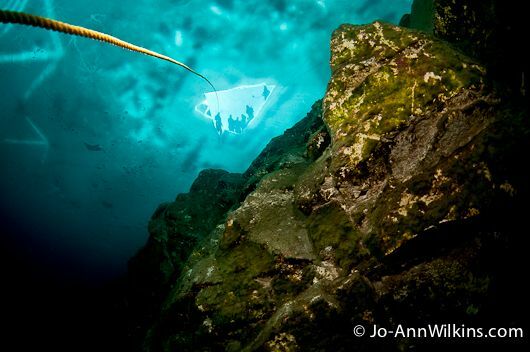 2011 Ocean Art winner Jo-Ann Wilkins is an underwater photographer in the provinces of Quebec and Ontario, Canada. She is an experienced dive instructor and dive charter operator who also specializes in cold water diving where she can photograph underwater marine life and wrecks of any kind. Her work also includes underwater pool sessions with pregnant women, babies, children, pets, and fashion models. Please visit her website at www.jaw-photo.com. Questions or Comments? Post in our forums! 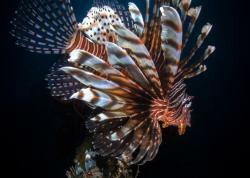 Please support the Underwater Photography Guide by purchasing your underwater photography gear through our sister site, Bluewater Photo and Video. Click, or call them at (310) 633-5052 for expert advice!